2000 Exhibited Will's Art Warehouse and regularly at the Affordable Art Fair. 2003 Colour ways and Motorways. The Hollywood Gallery. 2006 Another Country. The Hollywood Gallery. 2007 Group Shows at Diesel House Studios. 2007 Solo Show. The Galleria Ealing. 2007 SW13 Group Show. Will's Art Warehouse. 2014 The Land and the Sky. Group Show at the Riverside Gallery Barnes. 2014 Exhibited at the Gallery at Ice - Windsor. 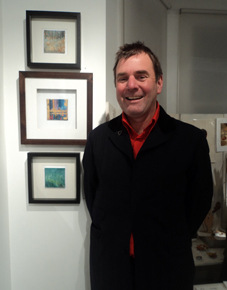 2015 Exhibited No Naked Walls Gallery - Chertsey. 2015 Summer Show Highgate Contemporary Art. 2013 'Still' Group Show Gallery 286. 2014 The Land and the Sky Riverside Gallery Barnes.